A plan for a Scottish-based stock exchange, focusing on social and environmental companies, has secured a partnership agreement with a major European stock market operator. Bourse Scot Ltd is being planned by entrepreneur Tomas Carruthers, who has been involved in innovative trading platforms before. It would be the first Scottish stock exchange since the closure of the trading floor in Glasgow in 1973. That was a merger of exchanges in Glasgow, Edinburgh and Aberdeen. Euronext has agreed to provide its Optiq software platform for a virtual exchange based in Scotland, which is being aimed mainly at companies worth between £50m and £100m. Bourse Scot expects to launch a Scottish stock exchange in the second quarter of 2019, if it secures regulatory approval. 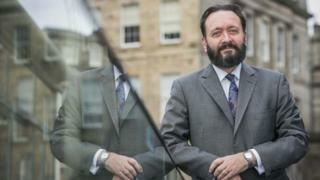 Mr Carruthers, an Edinburgh-trained accountant, says he is already in talks with a number of potential issuers who intend to use it to raise investment. He hopes the renewables industry will see it as a place to raise funds while maintaining control and headquarters, rather than selling to a bigger company, or a dominant stake being sold to a private equity investment firm. The business plan is to win public funds, and create around 60 skilled jobs. These would be based in Edinburgh, with offices planned for Glasgow and Aberdeen. The jobs would include marketing, to attract firms and investors into the market, and compliance. Stock exchanges need to police their rules to assure investors they can trust hat they are being told. The plan for a social and environmental exchange would involve rules about the activities of such firms, with staff requiring participating firms to prove what they claim about social and green outcomes. Mr Carruthers commented: "Stock exchanges play a vital role in bringing together investors and businesses seeking investment. In the 1960s there were five such exchanges across Scotland, enabling Scottish investors to directly fund business opportunities which, in turn, supported economic growth. "Fifty years on and the economic landscape in Scotland is very different. Growth sectors such as renewable energy and biotechnology have once again established Scotland's standing as a centre of global excellence. A Scottish stock exchange will ensure companies can continue to find the financing they need to reach their full potential." The businessman's main business success was as founder and chief executive of Interactive Investor, an online trading platform created in 1997. He was also appointed by Prime Minister David Cameron to run the Social Stock Exchange, for companies with a social mission, where he was chief executive from 2012 until last year.